Located in the city of Oxnard within Southern California’s Ventura County is Saint Anthony’s Catholic Church. This modern House of God is a spacious venue for Catholic couples to exchange vows and undertake religious rites and rituals that are important to them. Wedding ceremonies can be held in both English and Spanish, and are conducted by Saint Anthony’s priests and deacons. Saint Anthony’s Catholic Church features beautiful stained-glass windows along both sides, with wood panelling behind the altar and ornate hanging lamps. Religious artwork and sculptures adorn the interior, while wooden pews line both sides of the aisle. The exterior features a courtyard where couple portraits, bridal party portraits and family formal photos can be taken, with intricate decorations on the facade and a white tower to one side. The parish is dedicated to building a community of Christian stewardship and evangelization, according to God’s Word and Sacraments. For its parishioners, entering into the Sacrament of Marriage here is a public statement about their beliefs and the loving union they will create according to God’s family values. But Saint Anthony’s Catholic Church also welcomes non-registered couples to chat with their pastors and deacons about upcoming wedding plans. Attending Mass on Sundays is an ideal opportunity to experience the ambiance of the church and connect with its parish. The church can provide a wedding coordinator to help plan the readings, musical options and details of your wedding liturgy, and a rehearsal is included in the fee. 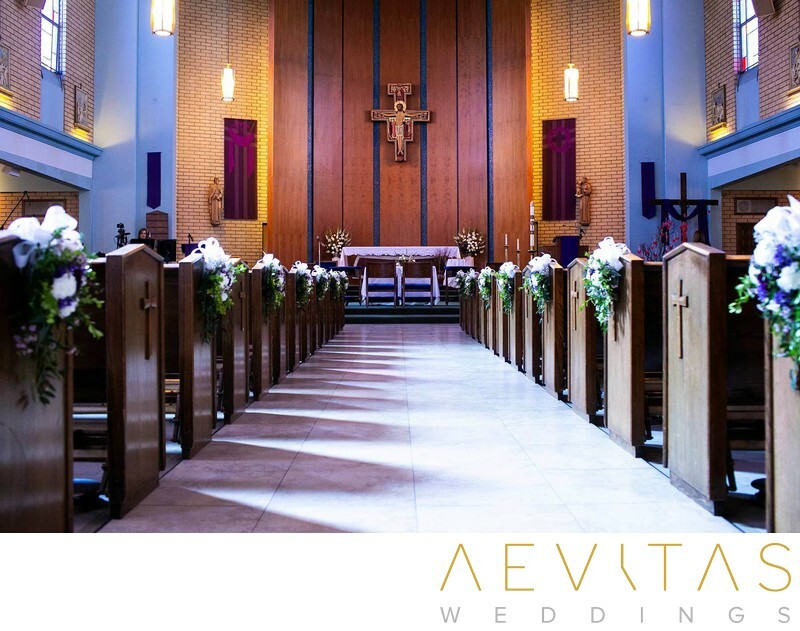 Because St Anthony’s Catholic Church is a religious venue, there are fairly strict requirements about what is permitted in terms of decorations and photography, and no reception space is available on-site. But for those who wish to enter into Holy Matrimony in a House of God of significance to them, then Saint Anthony’s is an elegant choice.